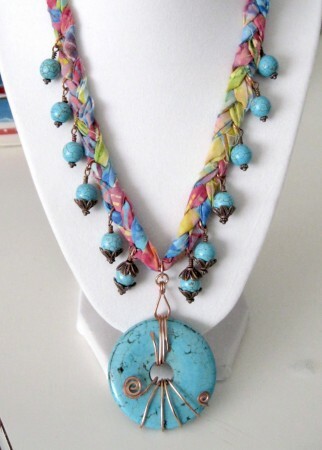 Mixed Media is still a popular technique in the beading work, and since so many of us have other crafting hobbies, it is a fun way to merge those hobbies and come up with entirely new techniques and stunning jewelry. Sometimes it’s just not enough to express ourselves via one art medium, so I thought I’d mix it up today by focusing on art to wear: mixed-media jewelry. Accessories are such a personal thing—our jewelry helps to define us by showing what we like, and who we are (I usually go for earth-toned beads and feather earrings, but will sport a little timeless silver for a business occasion, for example). 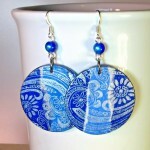 These are my latest decoupage and embossed hand stamped earrings made from scrap paper and wood discs. Like little pieces of art, they are all unique and one-of-a-kind. 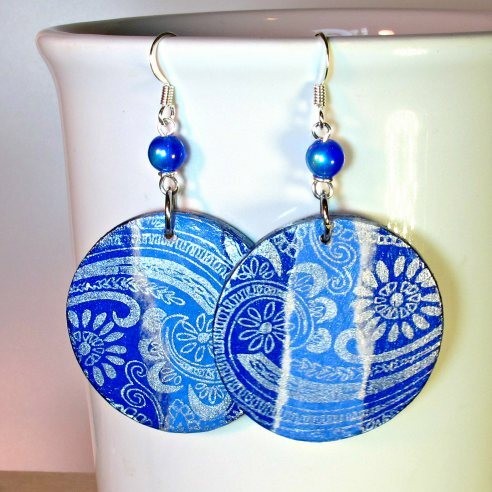 You can either make these yourself; see my DIY earrings tutorial or find these and other lightweight, colorful unique handmade earrings ready to ship in my Etsy store! 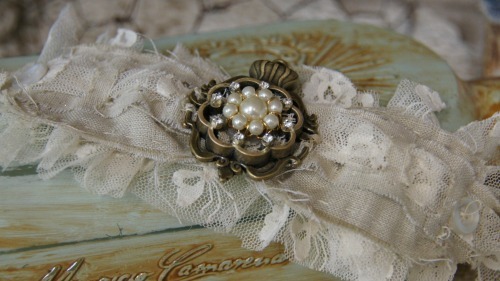 Today, I’m sharing a simple sewing project made with dies and bezels from the newest Spellbinders® line A Gilded Life. I was going through my fabric stash, much of which I inherited from my Mom. So I combined some of the bits of lace she left me, with some scraps of muslin left over from another project. Broken bits of jewelry were the perfect compliment. Cloth Paper Scissors Editorial Director Jenn Mason played with the components of this Charmed & Lucky Mixed-Media Jewelry Kit and came up with the Lucky U necklace pictured here. The directions for the finished Lucky U necklace will walk you through the making of this finished piece, but Jenn considered many ways of using the ICED Enamels, Stencil Girl custom stencil, heart blanks, and jewelry findings in this kit. Grab your jewelry pliers and let’s wrap up some wire for jewelry projects.